It seems the Hills is divided into people that know of Betty’s Burgers & Concrete Co. and those that don’t. We foolishly fell into the latter category until recently, when we heard about the imminent arrival of the burger and concrete chain to the Piazza in Castle Towers. 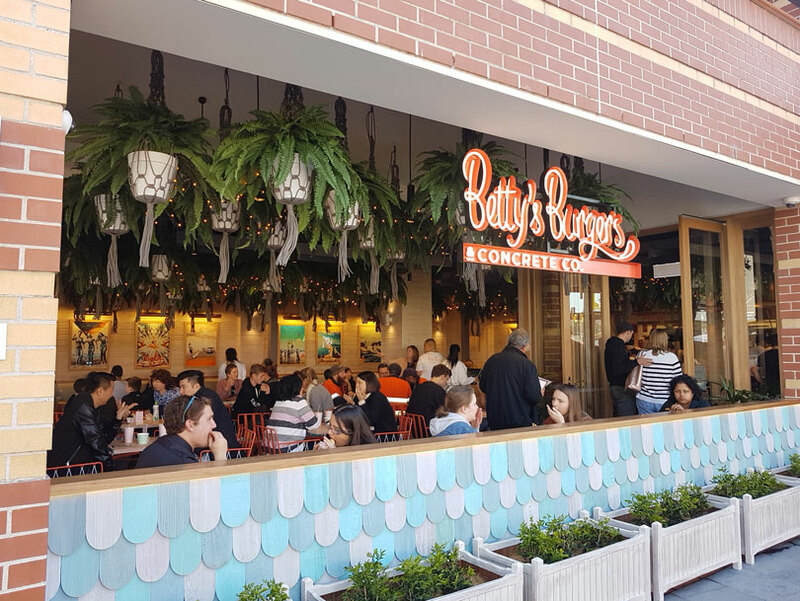 Those that know Betty’s from places like Noosa and other sunny Queensland destinations talked of the burgers with nothing but love and reverence. 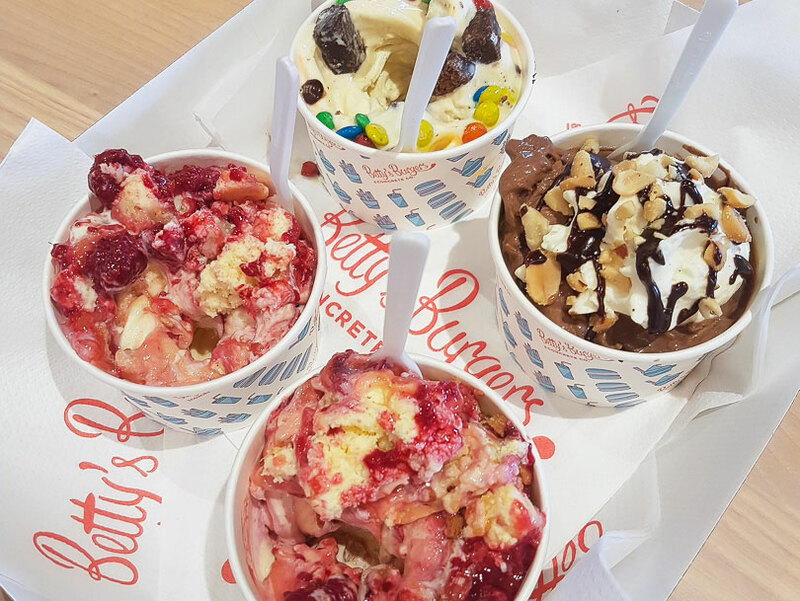 One Hills District Mum confessed to having Betty’s every day on a holiday to Noosa! So, with Betty’s Burgers arriving in the Hills, we were super keen to check it out and it’s safe to say we’re now official converts too! Let’s start with some background. Who’s Betty you may wonder? She was the grandmother of one of the founders and apparently made a mean burger – good one Betty! So the name is a nod to her, as is the retro beach shack décor. And the next question you may have is “What the heck is concrete?” – more on that later. Betty’s has been big in Queensland for a while and is now spreading the love around other states. It offers diners a fast, casual dining option (read: super family friendly) without the negatives of fast food. You can linger in the relaxed retro-cool environs and even enjoy an alcoholic beverage or two! Also, staff are really well trained and professional – this was even the case on day 4 when we visited. It was super busy yet was already running like a well-oiled machine. Majorly impressive. Castle Hill is the second store in NSW and the company is seriously excited about this site and the community they’ve been greeted with – we’re a welcoming bunch, particularly when great burgers are on offer! So let’s talk about those burgers. We confess to sometimes being a little disappointed when we order burgers out. They can fall flat and can be dry and not that great, leading to meal envy and disappointment. So when we visited Betty’s for lunch we had our fingers crossed big time. There had been such hype that we were worried they wouldn’t live up to it. But wow, that was definitely not the case! They were bloody fantastic! There are only a handful of options on the burger front. It’s not a huge array but we like that. It says to us that they focus on doing a few things really really well and offer fresh, simple, tasty choices. There’s the Betty’s Classic with Angus beef, lettuce, tomato, onion, cheese and Betty’s special sauce. You can make this the Deluxe with the addition of pickles and bacon. There’s also a Crispy Chicken burger and a Pork Belly option too. Vegetarians are catered for with the Shroom Burger – a crisp fried mushroom patty with melted Gouda & Gruyere cheese, lettuce, tomato and Betty’s special sauce. There’s also the Bare Betty which is a bunless option for coeliacs. We opted for the Betty’s Classic Stack – the Betty’s Classic and a Shroom Burger combined. And it was sensational! We’re already looking forward to another! The beef was juicy and we loved the milk bun. It also actually fills you up without being offensively large. Word on the street is there’s a ‘secret’ menu too, with a few other items that aren’t listed on the menu. We’re not sure how one goes about finding out exactly what’s on it – maybe you get a special code on your hundredth burger or something? Don’t know, but will have to suss it out in case we’re missing something. There are also kids’ options on the burger front – a chicken and a beef. And guess what? There are no darn nuggets in sight. GOOD! Now, back to that concrete. Again, a clueless confession – we had NO idea what this was! We presumed it was some sort of ice-cream, but please PLEASE don’t call it JUST that! It is SO much better than your standard ice-cream! It’s made daily in-house and is a creamy vanilla or chocolate frozen custard confection with various ‘mix ins’. You can choose from the menu where options include Chocolate Fudge Donut, Peanut Butter Brittle and Lemon Raspberry Cheesecake or you can select your own ‘mix ins’ such as Malteasers, meringue, choc chip cookie dough and salted caramel popcorn. It was seriously good – we’re looking forward to taking our poor child who was at school back to try it! One thing to mention, particularly when dining out as a family, is the pricing. We think it’s excellent and won’t break the bank if you’re taking everyone out for meal. 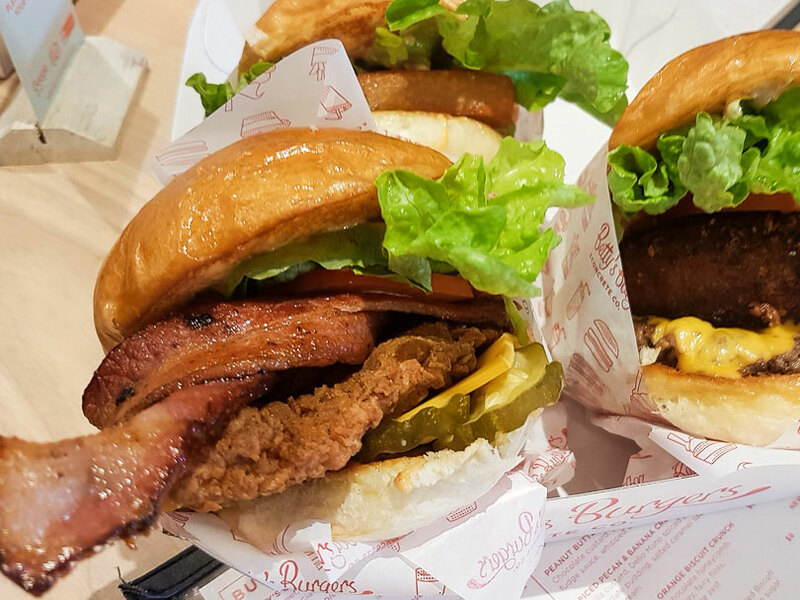 For example, the Classic Betty is $10 and Crispy Chicken burgers are $11, kids’ burgers are $8 and the concretes are $8 each as well. This is a big thing for families so we’re really pleased that there’s a great new reasonably-priced option in the Hills. 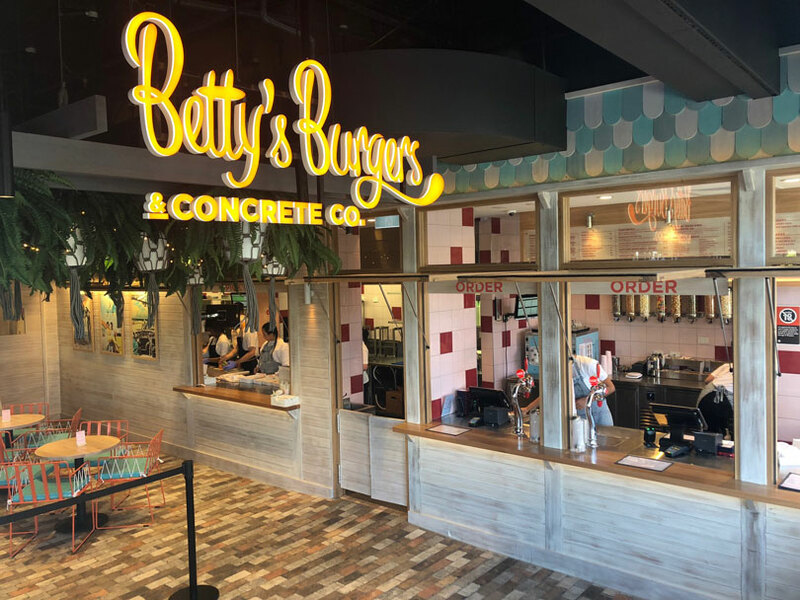 So, if you’re craving a burger or are curious about this concrete, Betty’s is definitely one to check out. We know for sure we’ll be back again. Welcome to the Hills Betty! Shop 1-2A The Piazza Level 3, Castle Towers. Hours: 10.30am – 10pm every day. Kid and pram friendly with high chairs available. Thanks to Betty’s for hosting us.